Storyboards are tools that help communicating how a user would experience a product or service and how the proposed design will help them accomplish their goals (user journeys). This methodology has been borrowed by the movie industry and allows describing the interaction between the user and a product/service on one or more frame by showing the key experience touchpoints. 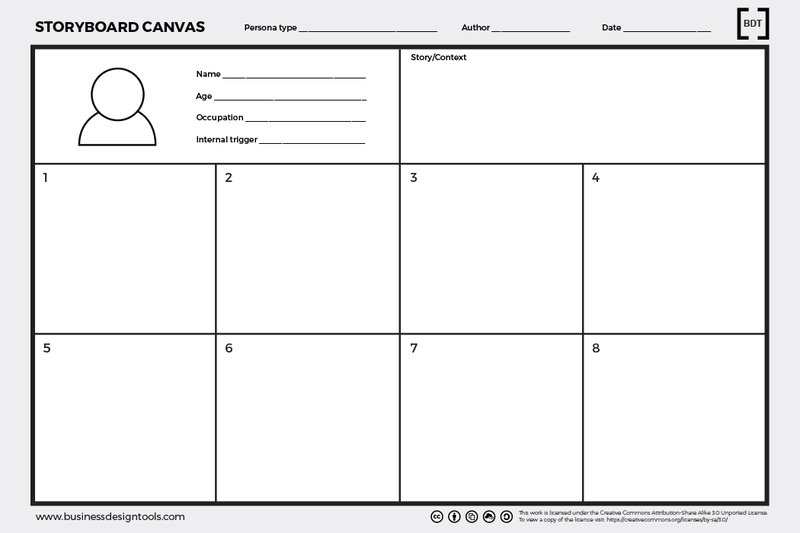 Storyboards are great ways to share a concept with customers and make them understand concepts and design ideas. They can be used during design workshops to gather feedback and to help identify areas of improvement or missing elements of the experience. They can be considered as quick prototypes of the experience which also help entrepreneurs empathise with their customers. Storyboard can be created in different ways. The most common is a sequence of images or sketches accompanied by a short description of the actions the user is taking in each touchpoint. Kim Goodwin, Designing for the Digital Age: How to Create Human-centered Products and Services. (Indianapolis: John Wiley & Sons, 2009).